Hades, a paragon of nobility. It is with a sad heart that I must announce that my good and faithful guardian has taken his final prance across the Rainbow Bridge. 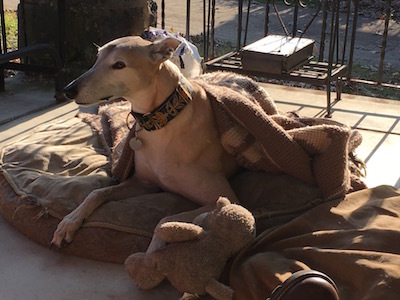 Last week, Hades the greyhound was diagnosed with bone cancer, and Aurora and I decided to take him on his final visit to the vet, rather than let him deteriorate further. He’s shown up in this blog before, most recently, demonstrating his intimidation skills with his doll. 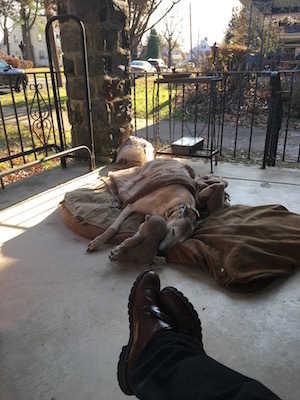 Fortunately, we enjoyed some unseasonably warm weather last week, and Hades was able to spend some of his final hours in one of his favorite pastimes: relaxing on the front porch, alternating between keeping an eye on the neighborhood and napping. How Hades and I spent our last afternoon, together.